The sun is the source of life and plays a vital role in development. However, it can be harmful to the body, especially to the skin. It is crucial to use sun protection. The sun, friend or foe ? The sun is the closest star to us. It is a source of pleasure but sun rays can have harmful effects on your skin. -UVAs: Penetrate deeply into the skin, can damage elastic fibers and are responsible for premature skin aging. They are also responsible for certain types of skin cancers. -UVBs: Stimulate the production of melanin resulting in a tan within 48 hours. Can cause sunburns in the short term and premature skin aging in the long term. Can also increase the risks of certain skin cancers. Your skin can react to the sun in many ways and these reactions are more or less quickly visible…… based, in particular, on your phototype. It will dictate your sun resistance. It is therefore key to know your phototype. Tanning is the body’s natural protection from UVs. The melanocytes from the lower layer of the epidermis produce melanin (a brown pigment) which absorbs sun rays and creates a shield from the sun. Sunburn, a burn induced by UVBs, a sign of overexposure. -First degree looks like a red area outlining the exposed zones. It is painful and burning. -Second degree consists of water bubbles and blisters. -Feeling faint, a headache, a fever, or dehydration from heatstroke can be part of the symptoms. Overexposure excesses and lack of protection might cause other problems. Photodermatosis: These disorders are also called “sun allergies” Benign summer lucite is the most common (eruptions and itching on the neckline and the forearms). « Polymorphic » light eruption and solar urticaria are more rare. 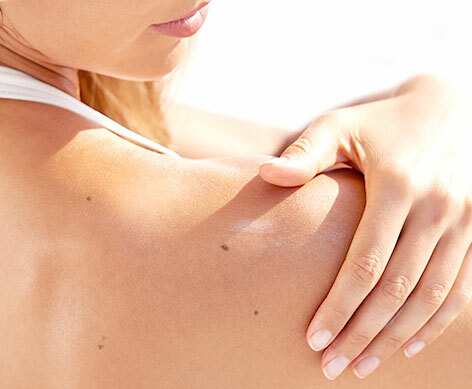 Sun spots: Brown spots that can appear on the most exposed areas (face and hands). Skin cancer risk : Protect yourself from this real risk. Check your moles and spots regularly. Examining your skin regularly is crucial for early detection of melanomas. It is easy to do, alone in front of a mirror or with the help of a family member. Are UVBs more dangerous than UVAs ? UVBs are as dangerous as UVAs. Both are involved in skin aging and cancers. Unlike UVBs, UVAs are responsible for sunburns and our body doesn’t have a natural warning system against them. Does a sunscreen prevent you from tanning? No. You are protected against the harmful effects of UVAs and UVBs (solar erythema and long-term, skin aging) but the tanning process is not necessarily eliminated. After a few days of sun exposure, you will get a nice tan without putting your skin at risk. Does a cloud cover prevent tanning? Can you get a tan while under an umbrella? Clouds only stop a small portion of sun rays. A cloud cover can let up to 95% of UVs go through. So, be careful! Under an umbrella, you get half of the sun rays. Light and UVs can reach the skin indirectly as it reflects over various surfaces. This reflexion is 20% over the ocean and 15% to 25% over sand. Be very careful! Once tanned, can you be in the sun without protection? Don’t ever forget that a suntan is not a protection against sunburns. In addition, a tan doesn’t prevent UVAs which, over time, are responsible for skin cancers. Does sun exposure increase the risk of herpes? The herpes virus remains dormant (asleep) in the nerve tissues. Under stress, emotions, menstruation and the sun, it “wakes up” and a flare-up occurs: The fever blister. In order to avoid it, protect your lips with a high protection lip product. Tips for the best possible sun exposure? 2. Babies under the age of 3 should not be exposed to the sun. 3. Young children should be very protected. 4. Sunburns are always dangerous, especially for children. 5. Avoid sun exposure between 11AM and 4PM. 6. Sun exposure must be gradual. 7. Sand, snow and water can reflect more than half the sun rays on your skin. Clouds do not offer a good enough protection. 8. You must reapply your UVB and UVA protection sunscreen every two hours and after bathing, whatever its SPF. 9. Choose a sunscreen based on your skin type. 10. A sunscreen is not meant to let you stay in the sun longer. 11. At altitude or under the tropics, it is necessary to use a higher SPF sunscreen than usual. 12. Drink water regularly, watch over youngsters and don’t forget the elderly. 13. Choose your sunscreen wisely and apply it carefully.